This abbey was built in 1103 for Guillame 1st, under the guidence of the Cluny Cistersian monks. 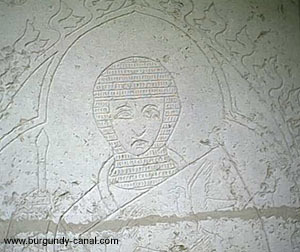 The influence of the abbey grew within the region up to the French revolution, where the monks where forced to abandon thier dewlings. The lands and buildings where divided amongst the local inhabitants. Until the early 1900s the buildings fell into ruine, when the abbey was purchased and very lovingly restored. From the 1970's until 2002 the abbey was a retreat and summer school for young and old. The park and most of the building open to the public. 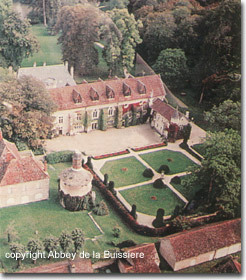 Now the abbey is a very high standing luxury hotel and gourmet restaurant. They were awarded their first Michelin star in 2007. 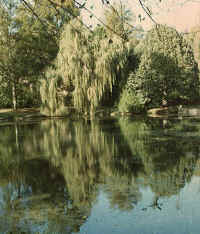 The park of Abbey de la Bussiere is a place of calm and meditation. You can enjoy walking along the paths of the monks that lead up into the hills. 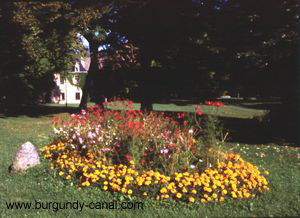 In spring and summer the gardens give an abundance of flowers. Water, water everywhere with in the abbey, there are springs, streams and fountains. Within the abbey grounds, you'll find buildings for many different purposes, such as this pigeon house which sates frim the 15th century. Tombstones of crusading knights, remain in the garden. In the nearby church cemetary are ANZAC war graves, from the RAF.